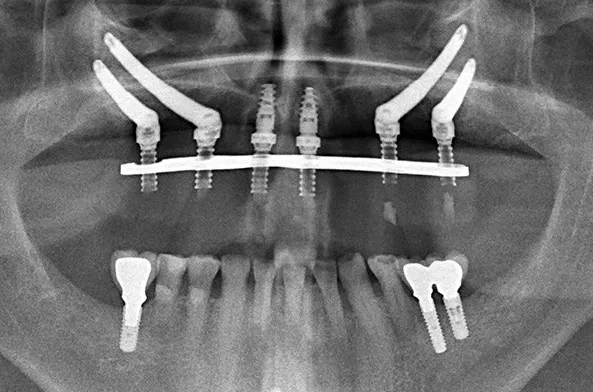 Zygomatic implants with All-On-4 Plus®. Zygomatic implants are special dental implants that can make upper implant teeth replacement possible for patients who have insufficient upper jaw bone. Zygomatic implants bypass the region of missing or atrophic or shrunken upper jaw bone (maxilla) altogether, by going along/through the (maxillary) sinus, and embedding into the base of the cheek bone (zygoma), to provide a foundation for All-On-4 style teeth attachment. The purpose of zygomatic implants is to still allow the attachment of immediate teeth after just one surgery wherever possible, and to avoid any need for bone grafting prior to implants. They can provide an immediate aesthetic and functional smile outcome for patients with insufficient upper jaw, such as those who have worn dentures for a long time and may have lost all of their upper jaw bone in the maxilla, or those with very large sinuses that occupy the upper jaw space. If you are technically minded you may like to read this paragraph to learn more about All-On-4 Clinic’s approach with zygomatic implants, called Zygoma Plus. If not, then skip to the next paragraph! Zygomatic implants are placed in different methods by different surgeons around the world. They can pass inside, partially inside, or outside the maxillary sinuses before they embed into the cheek bone. They can also end up with the “tooth end” or “implant platform” inside, partially inside or outside of the dental arch bone area. When the zygomatic implant is placed too far to the palate (the method employed by many maxillofacial surgeons), cleaning and long term maintenance can be a problem. When it is placed too far outside the jaw bone, then the gum may be irritated. Zygoma Plus is an approach that prioritises the exact positioning of zygomatic implants in a manner that is best for teeth attachment and long term cleaning. It can also involve the gentle reflecting away of the sinus membrane and bone substitute deposition below it, alongside the zygoma implant placement. We have an emphasis on “leukocyte and platelet rich fibrin” (L-PRF) placement to reinforce the membrane below the implant, possibly with bone substitutes, to encourage new bone formation and maximise the opportunity for healthy sinuses below the body of the implant. Will I need zygomatic dental implants? Often, prolonged periods with missing teeth and use of removable dentures may stimulate the loss of jaw bone. Shrinkage of the jaw bone is a natural phenomenon with missing teeth, and it may cause loss of any bone foundation for conventional dental implants. In many of these cases, the sinuses (air spaces) above the upper jaw also expand, reducing the bone foundation even further. If your upper jaw bone (maxilla) doesn’t provide enough bone mass to apply traditional implants, zygomatic implants may allow you to benefit from immediate implant teeth replacement, without any stages or prior bone grafting. 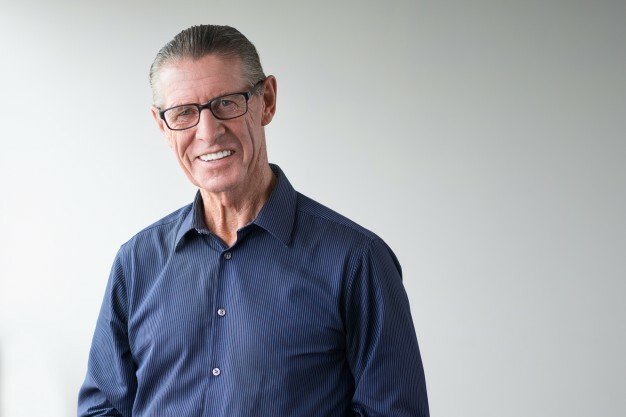 At All-On-4 Clinic Perth we can integrate zygomatic implants in your treatment plan, based on an in-depth assessment of your jaw and facial bone structure and teeth replacement needs. To know if you could benefit from zygomatic implants (or All-On-4 Plus Zygoma or Zygoma Plus ®), we will assess CBCT (3-D imaging) of the condition of your upper jaw (maxilla), sinuses (maxillary sinus) and cheek bone (zygoma). We will discuss this option in comparison with other options which graft bone to the upper jaw (such as sinus elevation), and see which is more suitable for your case. All on 4 Plus Titanium is a full teeth replacement method, fine-tuned by Dr Misagh Habibi at All On 4 Clinic Perth for stronger and more aesthetic new teeth than conventional All-On-4 methods, within just 1-4 days of just one surgery. If we need to incorporate zygomatic implants, you still benefit from this same timeline and approach. All-On-4 Clinic Perth is led by Dr Misagh Habibi, who has developed a particular expertise in complex implantology and implant related oral surgery. His friendly and qualified team provide a relaxed and comfortable environment, in a state-of-the-art clinic in Subiaco. Complex treatments can be performed under IV Sedation dentistry for patient comfort. If you’re considering advanced dental reconstructive work involving dental implants, it’s important to know that the team you entrust carries out such procedures regularly with the highest attention to detail and optimal care.